UPDATE: Here's a little info I didn't get a chance to type up yet. In the Spring of 2015, I was sent an image of some adorable hats by a friend via Facebook that didn't have a link. I loved the hats and finally found that they were originally in Russian, which I cannot read, and which Google couldn't translate. A week or so later I searched again, and I found that a woman in Australia had been feverishly working to crack the crochet pattern using the images from the Russian page. Her pattern was instrumental in determining my own adaptation. My pattern is different in that I use worsted weight yarn (easy to find at craft stores and Walmart - I recommend Caron Simply Soft or Hobby Lobby I Love This Cotton). Also, It's available in printable PDF (via Ravelry, click the "download" button), so you can carry a copy of it with you. Thanks for visiting my blog and checking out this pattern! 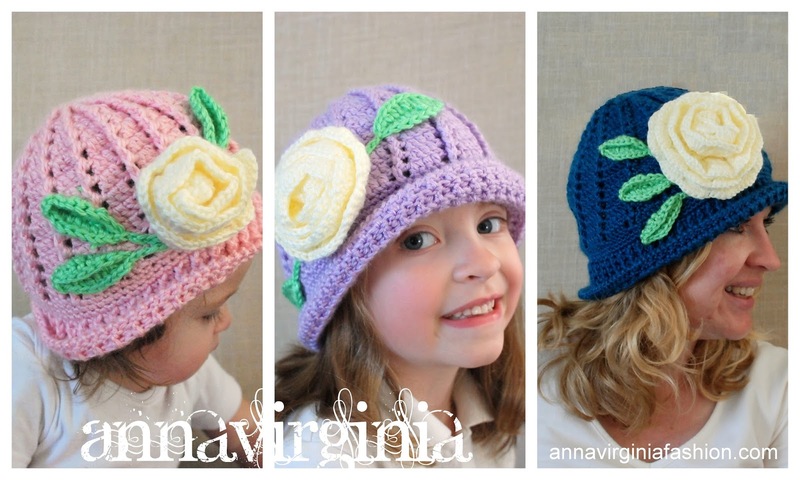 Here is a blog-post version of my Soft and Sweet Easter Hat pattern. You may print a copy of this post. Click on a photo to enlarge. The pattern is also a free PDF via Ravelry. You will need the latest version of Adobe to open the PDF. Please do not sell or redistribute pattern as your own. Skeins: One 6.0 oz skein for main color. Less than one skein is needed in colors for embellishments (leaves and rosette). CH 3 at beginning of Rnds count as DC unless otherwise stated. Rnd 1: Ch 4 (Counts as Ch 1+DC). Rnd 2: Ch 4 (Counts as FPDC + ch 1). Rnd 3: Ch 3. FPDC around starting ch from rnd 2. Ch 1. Rnd 4: Ch 4 (Counts as DC + ch 1). FPDC around first FPDC from rnd 3. Ch 1. Rnd 5: Ch 3, DC in same sp. Ch 1. FPDC around first FPDC from rnd 4. Ch 1. *2 DC in next DC. Ch 1. FPDC around next FPDC. Ch 1. * Repeat ** around. Sl st to top of starting ch. Rnd 6: Ch 3. DC in same sp. DC in next st. Ch 1. FPDC around first FPDC of rnd 5. Ch 1. Rnd 7: Ch 3. DC in same sp. Dc in each of next 2 sps. Ch 1. FPDC around first FPDC of rnd 6. Ch 1. *2 DC in next DC. DC in next 2 sts. Ch 1. FPDC around next FPDC. Ch 1. * Repeat ** around. Sl st to top of starting ch. Rnd 8: Ch 3. DC in same sp. DC in each of next 3 sts. Ch 1. FPDC around first FPDC of rnd 7. Ch 1. *2 DC in next DC. DC in next 3 sps. Ch 1. FPDC around next FPDC. Ch 1. * Repeat ** around. Sl St to top of starting ch. BABY Rnds 7-14 (smaller heads stop at rnd 13): Ch 3. DC in same sp. DC in next st. Sk 1 DC. Ch 1. FPDC around first FPDC of prev rnd. Ch 1. CHILD Rnds 8-16 (smaller heads stop at rnd 15): Ch 3. DC in same sp. DC in each of next 2 sts. Sk 1 DC. Ch 1, FPDC around first FPDC from prev rnd. Ch 1. *2 DC in next DC. DC in next two sts.FPDC around next FPDC. Ch 1. * Repeat ** around. Sl St to top of starting ch. ADULT Rnds 9-18 (smaller heads stop at rnd 17): Ch 3. DC in each of next 3 sts. Sk 1 DC. Ch 1, FPDC around first FPDC from prev rnd. Ch 1. *2 DC in next DC. DC in next three sts. FPDC around next FPDC. Ch 1. * Repeat ** around. Sl st to top of starting ch. Rnd 1: Ch 1. SC in same sp. *SC in each DC. SC in ch-1 sp, sk FPDC, SC in next ch-1 sp. * Repeat ** around. Sl st to top of first SC. Rnds 2-3: Ch 1. SC in each st around. Sl st to top of first SC. Rnd 1: Ch 3. FPDC around post of first SC from prev rnd. BABY Rnds 2-4 or CHILD Rnds 2-5 or ADULT Rnds 2-6: Ch 3. FPDC around post of first FPDC from prev rnd. Last Rnd: Ch 1. Reverse SC across each st. Sl st to top of first reverse SC. Fasten off and weave in loose ends. Ch 10. SC in second ch from hook. HDC in next. DC in next 2 chs. TR in next 2 chs. DC in next ch. HDC in next. 3 SC in last ch. Turn work so that you continue to work along the other side of the chs. HDC in next ch. DC in next ch. TR in next 2 ch. DC in next 2 ch. SC in last ch. Sl st to very first SC. Ch 10 (for stem). Fasten off and leave a long tail for sewing to hat. ROSE: 3 size options.Make 1. Row 1: Ch 33 (53, 83). DC in fifth ch from hook (ch5+DC counts as first V-st). *Sk 1 st. Ch 1. V-st in next st.* Repeat ** across. Turn. *Ch 1. Double V-st in next V-st sp. * Repeat ** across. Shell in each Double V-st across. Fasten off, leaving a long tail for sewing to hat. Sew into a rose by rolling the twisty strip together. Place leaves on hat in desired placement. Sew on along stem and only across the center of the leaves from stem to tip (allows for a 3D appearance if the outer edges are left unattached). Attach flower to hide the ends of the stems, mainly allowing the leaves to be shown. This is great! I love these hats but didn't like that yarn wasn't available or was expensive. Excellent job,thank you! I am so happy to see you posting again...just a few days ago I wondered if I should take you off my blog list! Hope to see more of your inspiring posts. I do have several blog posts ready on my mind, I just haven't gotten to typing them recently. Thanks for stopping by! Thank you so much for this pattern. I have a friend that saw the original posts with the cotton yarn and small hooks. I don't have access to alot of different yarns and tried Caron Simply soft with those small hooks. DISASTER!! 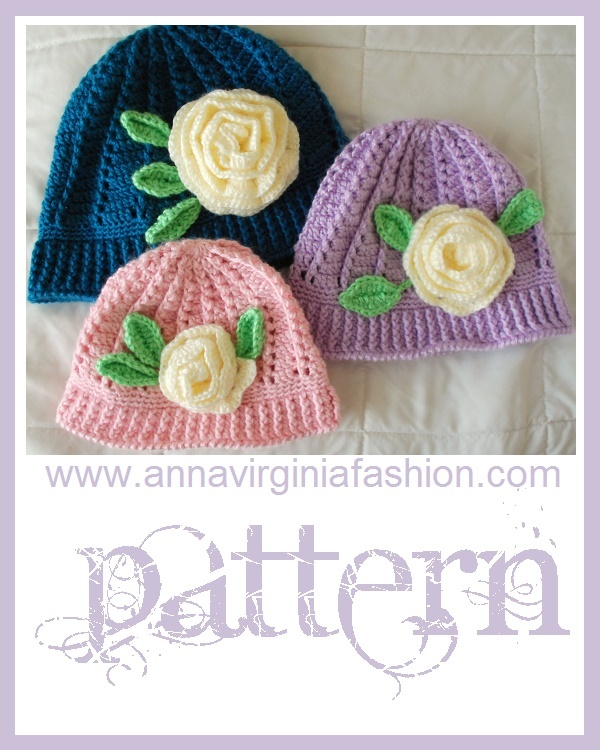 I have been searching for two days to find a pattern to do THOSE hats with MY yarn!! You are a life saver!!! Yay, I'm so glad you found my version! Sounds like it's just in time, too! Any keywords I should use to make my pattern easier to find? I'm wishing it hadn't taken two days! That's not your fault! I was using my phone and ipad. Once I used my pc and went into my ravelry account it was very easy to find!!! I'm up to the point on the pattern deciding which to use, the baby or bigger pattern. I asked my friend to measure her twin granddaughters' heads to get the correct measurement. I love this pattern! I've made many hats but I am a little concerned that it is not curving but rather working flat. I'm on round 11 of child size. Does it pull down after the band? Am I doing something wrong? Sounds like you're doing it right! It works out fairly flat until the band.